The Atlantic Coast Pipeline will bring fracked gas from West Virginia and Pennsylvania to Virginia, North Carolina, and perhaps South Carolina and beyond— its own builders seem uncertain as to where the ACP will end. A spur to the coast was announced suddenly in late 2017, leading to concerns that the gas may be headed for export, undermining claims Dominion’s own claims that the pipeline is intended to provide cheap frack gas to the US South. As might be expected of a pipeline that doesn’t even know where it’s headed, the ACP project is racked by unanswered questions. Virginia and North Carolina received seven-figure payoffs from the pipeline company, Dominion, immediately before final state permitting approval. The legality of these payments is dubious at best. Its builder, Dominion Energy, claims fracked gas will serve as a “bridge fuel” between aging coal and nuclear plants and a renewable future. They haven’t explained why we need a bridge, when mainstream market forecasts show 24-hour, unsubsidized solar and wind energy will be cheap enough to replace coal by the time the ACP is finished. In fact, cheap, 24-hour renewable energy installations to replace coal as a baseload power source are already in the bid and build process. 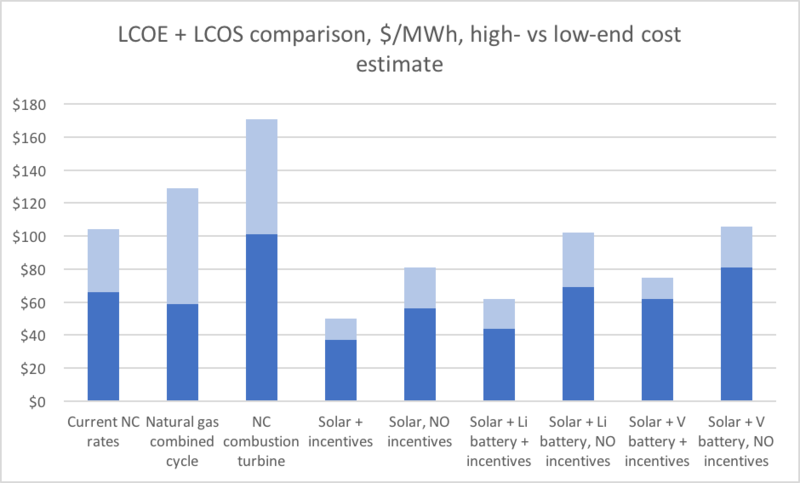 However, perverse incentives- including ACP investor Duke Energy’s legal monopoly on power generation in most of North Carolina and state licenses that guarantee returns on infrastructure investments- mean there’s little motivation to seriously pursue low-cost local energy like wind and solar in this region. There is motivation to build massive infrastructure projects to take advantage of guaranteed returns, regardless of whether they actually meet their customers’ needs. ACP has been marketed to local stakeholders as a jobs project that will bring manufacturing. There is little support for these claims. ACP has presented no evidence that energy costs are in fact a limiting factor for industrial development in Virginia and the Carolinas, or that the pipeline will truly address any industry needs. ACP partner Duke Energy has a history of manipulating natural gas supplies to drive up prices, when market structure has allowed them to do so. It has also abused this monopoly status to avoid accountability for coal ash spills, up to threatening to withhold power from federal military installations if fined. Given Duke’s legal monopoly in North Carolina, the ACP and its long-term commitment to fracked gas holds serious pitfalls for the state’s future that have not been examined. As a business strategist, I began looking into the ACP in mid-2017 so I could advise clients on what it would mean for their businesses. What I found was unconvincing. Findings and conclusions are summarized in the following report. It focuses on the ACP’s outcomes for businesses, primarily for North Carolina. This includes comparisons on economic outcomes of natural gas imports vs local power generation from renewable technologies; California’s disastrous experiment with reliance on natural gas in the early 2000s; and gas’s unsuitability for industrial development in the region. Unsubsidized local energy — solar and wind — has been cheaper than natural gas in North Carolina since 2015 (1). Figure 1 below shows the lowest-cost energy source, free of subsidies, in each county. In 77 of North Carolina’s 100 counties, that lowest-cost source is unsubsidized solar or wind (1). Figure 1: Lowest-cost energy sources in each county of North Carolina. Solar (purple, grey) and wind (green) are the cheapest energy source in 77 of North Carolina’s 100 counties1. These calculations do not include subsidies, tax credits, or externalities (e.g. damage from accidents, pollution-related costs such as increased healthcare, damage from accidents, etc). These figures are simply the bare cost of generating electricity by different methods. The nationwide figures shown in this map were assembled in 2015 by energy analysts at the University of Texas — a state with heavy investment in natural gas — and found natural gas to be non-competitive with local energy in the majority of North Carolina. Wind and solar have been the true, unsubsidized, lowest-cost source of power in North Carolina for nearly two years. This is despite natural gas prices being at historical lows during those last two years. This map also does not include the cost of firming, the industry term for ensuring 24/7 grid coverage. However, solar and wind are still competitive with natural gas even after accounting for firming. This is shown in detail in Figure 4. With grid-scale storage technologies are dropping rapidly in cost, the ACP is destined to be uncompetitive from the moment construction is finished. While wind is a low-cost source of energy, it is not covered in this brief due to the short-term moratorium on wind development in North Carolina. The remainder of the brief will focus on solar energy; with the understanding that many of the cost computations and local economic benefits of solar apply to wind as well. Storage technology has lagged behind generation technology. As a result, firming remains the main obstacle to adopting local energy. However, recent advances are making 24-hour renewable coverage competitive with conventional energy. The most significant technology in this area is the vanadium battery. Vanadium batteries have existed since the 1980s (2), but recent manufacturing advances have made them competitive at grid scale. Unlike lithium ion technology that uses intricate and damage-prone parts, vanadium batteries are extremely simple: two tanks of electrolyte and a membrane. This simplicity makes them safer (3), more robust (3), and much more affordable (2, 4) on a utility grid scale than lithium ion. Performance tests show them going through 14,000 discharge cycles — equivalent to at least 20 years of utility grid use — with zero loss in performance (2). Grid-scale vanadium battery use began with a 4 MWh installation in Japan in 2005 (5). Vanadium batteries have operated with an excellent safety and reliability record since that time (3). 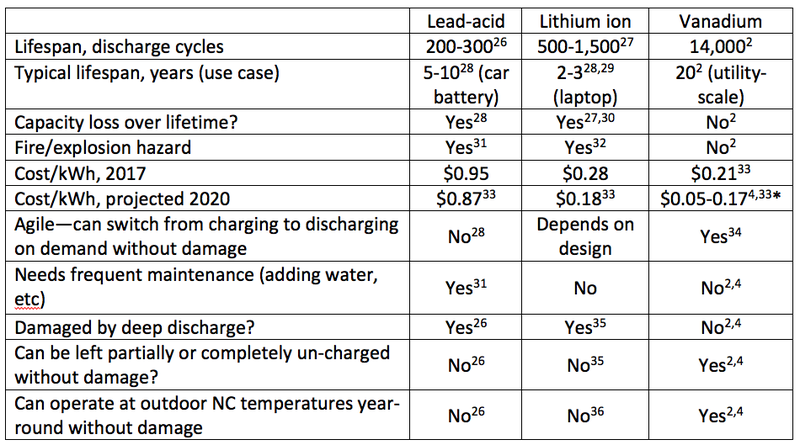 A compare-and-contrast review on energy storage technologies including grid-scale lithium ion and vanadium batteries is available in section VIII. Thanks to vanadium batteries’ robust affordability, China is investing heavily in this technology (6). A wind generation site in Dalian uses an 800 MWh vanadium battery for firming (2, 4, 6). China is also adding massive battery manufacturing capacity in anticipation of future demand. A single factory currently under construction is set to produce 3GWh/yr worth of vanadium batteries when at full production (2, 4, 6). Gas prices are currently at historical lows. New technologies have lowered the breakeven cost. Meanwhile, market distortions such as overbuilding have forced wholesalers to move natural gas at or below that breakeven cost, around $2.50–3/Mcf. In other words, natural gas cannot get cheaper. Gas can, however, get much more expensive — quickly and without warning. The natural gas market is characterized by demand/supply swings and price shocks. 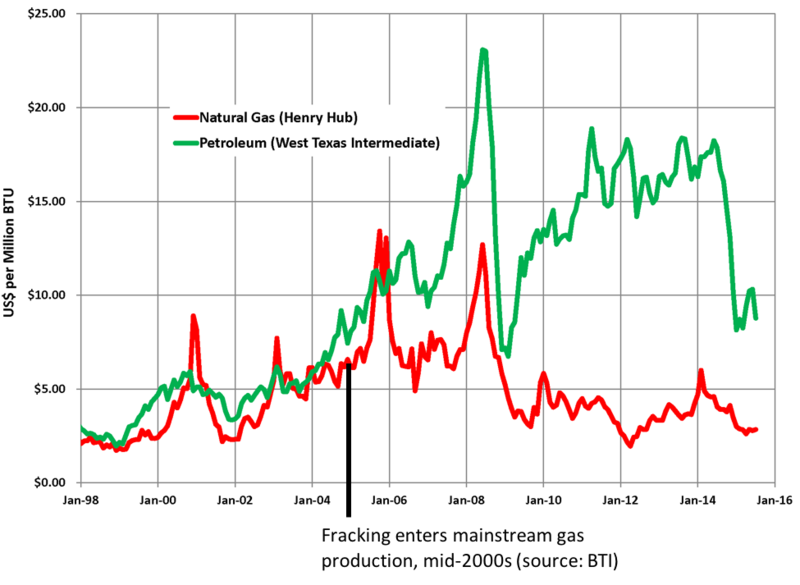 Figure 2 shows a history of US natural gas prices (generally set by the price at Henry Hub distribution point in Louisiana). Even after the advent of fracking — looked to as a source of cheap, abundant, reliable natural gas — prices have fluctuated wildly from $3 to $6 to $13/Mcf and above. Figure 2. Natural gas means accepting price spikes. The effect of gas price swings on electricity cost is shown below in rows 2–3 of Figure 3. Current North Carolina retail electricity costs are approximately $0.10/kWh, or $100/MWh, shown in row 1. 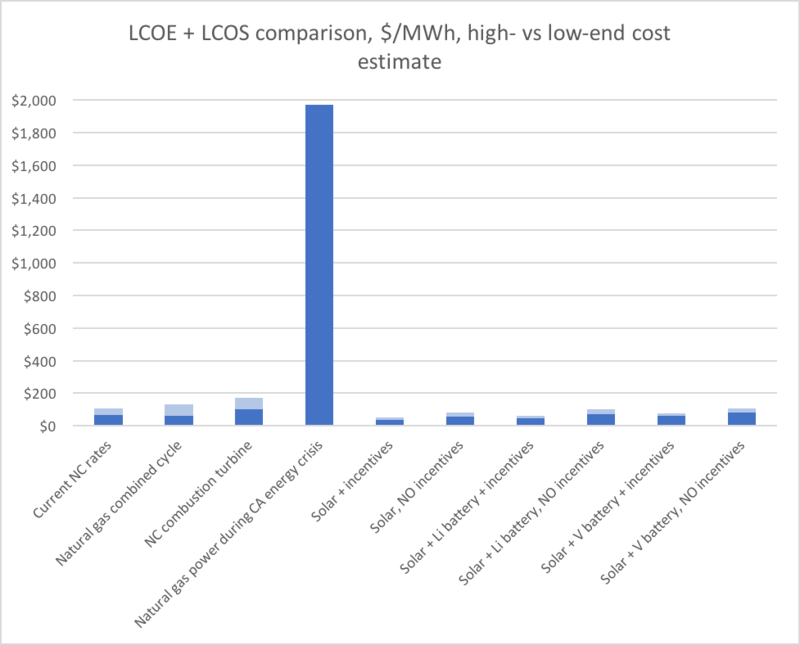 Cost comparisons with local energy — focusing on solar due to the moratorium on wind in North Carolina — are in rows 4–9. Rows 6–9 include the cost of firming, or adding utility-scale battery storage to supply the grid during nighttime and poor generating weather. Important note: the variation in solar prices (shown by light blue caps and multiple bars for solar) are caused by different installation systems and types of financing. In other words, once a solar system is built and a payment system established, its price is set. There are no fluctuating fuel prices; day/night power variation is steady and predictable down to the minute, allowing businesses to plan their activities; and local conditions such as cloudy weather do not pose a significant hazard for a regional grid equipped with energy storage (9,10). In fact, distributed power production like solar and wind are more resilient to extreme weather — currently the #1 cause of US power outages — than fossil fuel production, where loss of a single transmission line or pipeline can cut service to large areas (11). All-weather reliability and stable prices allow businesses and homeowners to plan ahead with confidence. In contrast, electricity based on natural gas means unpredictable prices during good weather and outages during bad, hindering business operations, planning, and expansion. Electricity demand is inelastic — it drops very little in response to price increases — since it is used for time-sensitive functions like refrigeration, HVAC, industrial processes, etc. The result is drastic price spikes (12). In states that adopted natural gas as their main grid power supply, gas supply and demand fluctuations have driven costs up to an inflation-adjusted average of $350/MWh (13) over large regions, for a period of weeks or months. During peak hours of these gas price shocks, spikes up to $1400/MWh (14,15), or $1,973/MWh in today’s dollars, occurred. A case study of the California Energy Crisis of 2000–2001 — which was largely the result of reliance on natural gas — is covered in section IV. Figure 5. Moderate natural gas price shocks can bring extreme spikes in electric costs. A natural gas-based energy future for North Carolina is a hostile environment for business growth. These price shocks bring extreme unpredictability into business operations that can be devastating. Businesses cannot plan for expansion, hiring, investing in new equipment, or opening new locations without a stable cost outlook. In spite of the environmental challenges posed by coal, nuclear, and gas, North Carolina still needs stable, low-cost, 24-hour electricity. 1) Competitive price — even after subtracting subsidies, and adding energy storage costs. 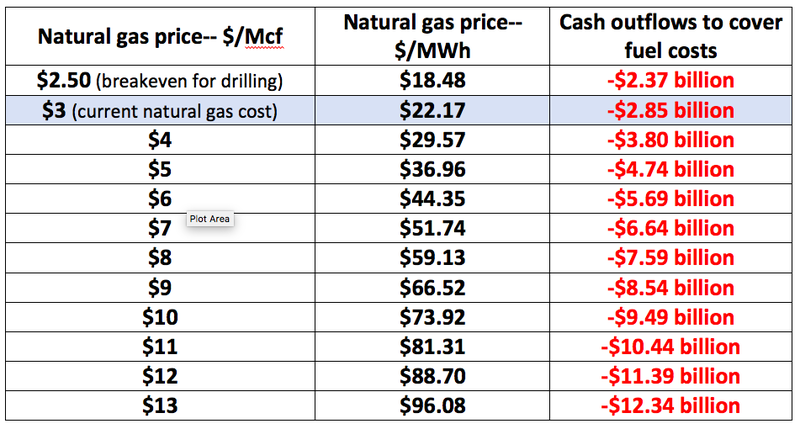 2) Reliable, stable price — compared to natural gas which forces price shocks onto ratepayers. 3) Local power — natural gas forces North Carolina to pay out-of-state for energy. Solar and wind can be generated in-state with local workers and manufacturing capacity, adding up to $12B in North Carolina’s economy every year. Points 1 and 2 are covered in sections I-III. The third point — opportunities for strong economic growth in North Carolina by using local energy — is discussed below. Pipelines are a two-way street: gas flows in, in exchange for dollars flowing out. North Carolina has no gas inside the state. Any strategy that relies on natural gas locks the state into dependence on imports, and into shipping money out of the state just to keep the lights on — no matter what the price. Figure 6. ACP outlook: natural gas cash outflows from North Carolina at different price points. Current gas price (about $3/Mcf) highlighted. Ratepayers and economists have long taken for granted that electric bills are a sunk cost — a necessary price for living and doing business — and that that money departs to areas that produce fuel. A natural gas strategy takes advantage of this ingrained habit. Again, this strategy is a losing one for North Carolina as it has no sources of natural gas. However, solar and wind are cheap and abundant in North Carolina. With affordable units and grid-scale batteries now available, renewables aren’t just competitive — they’re an engine for statewide economic growth. These opportunities are especially strong in less urbanized areas with affordable land and simple permitting processes, which have historically struggled the most to find opportunities for growth. A brief example of statewide and local economic gains from a local energy is shown below. Cumberland County, NC — a semi-urbanized area with access to Research Triangle energy markets — is used as a case study. Figure 7 shows economic gains from solar for Cumberland County from generating its own solar energy; from exporting solar electricity for the Triangle market; and total revenues retained within the North Carolina economy from a statewide local energy strategy. 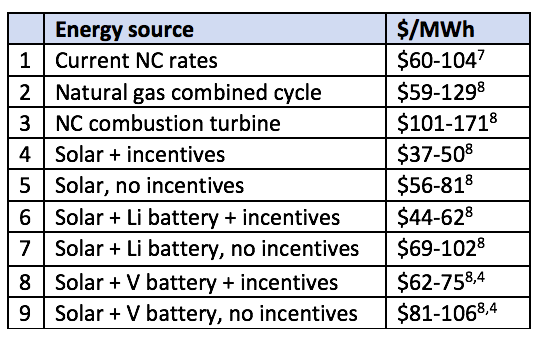 This example uses $90/MWh, which is both slightly below current residential energy costs in North Carolina and a price point that is reasonably achieved with unsubsidized, battery-firmed solar (see Figure 4). Under a solar strategy, Cumberland County would be able to generate its own electricity and retain up to $180 million dollars in the county per year. Using conservative estimates for job creation from operating & maintaining solar panels only (not counting solar installation or operating battery storage), this translates into 280 permanent full-time jobs (16) in Cumberland County — a substantial economic boost. Generating electricity for the Research Triangle market could bring up to $2.4 billion and an additional 3,750 permanent full-time jobs to Cumberland County, or these solar sites and jobs may be distributed across several rural counties surrounding the Triangle. Statewide, a local energy strategy would bring approximately 14,000 permanent, full-time jobs to North Carolina (see Figure 8). This is in line with the NC Clean Path projections (8), and is substantially higher than job growth possible with a gas-and-pipeline strategy. Figure 8. Construction and permanent full-time jobs in North Carolina, solar vs gas base power strategy. Figure 8 uses conservative estimates for solar jobs gains (used lowest value given in the source data for jobs/GWh). The solar jobs figures only include installation and O&M (operations and maintenance) for the panels — not for battery installation + O&M, or for PV and battery manufacturing jobs. Actual solar job figures are likely to be higher due these factors. Major job gains from renewable power are typical across the industry (17). PV, wind, and batteries have both one-time installation and ongoing maintenance costs, just like pipelines and power plants. However, gas plants must also be fed fuel to operate. A significant portion of each dollar spent on natural gas goes directly to paying for fuel (see Figure 6) — over $2 billion worth per year at today’s historical low fuel prices. In contrast, once installed, local energy needs no inputs other than maintenance by workers (18). For this reason, a higher percentage of renewable installation costs go to salaries compared to gas. Operations and maintenance jobs for renewables are tasks like cleaning, preventive maintenance, repairs, grounds-keeping to prevent brush overgrowth, etc. These are abundant, accessible, permanent blue-collar jobs. The economic growth power of local energy for North Carolina — especially its struggling rural areas — cannot be overstated. Other considerations for job and wealth growth include the in-state construction and manufacturing base for natural gas vs solar in the state. Natural gas is a poor generator of employment in all regions, but especially for North Carolina. With no natural gas resources within its borders, this state has no base of natural gas construction workers. Welders, fitters, inspectors, manufacturers of pipeline parts, etc., must be brought in as contractors from natural gas-heavy areas like Texas and North Dakota. Most of their salaries will leave North Carolina immediately. Meanwhile, North Carolina has a substantial in-state base of solar manufacturers and installers. These businesses employ North Carolina natives, including a high percentage of veterans who make up nearly 10% of the solar energy force nationwide (19). A solar strategy will engage skills and resources native to North Carolina, and build wealth that will stay in and continue to drive economic growth. Today California is a leader in local power, with about 30% of total energy (20) and 56% of energy during peak hours provided by renewables (21). However, this was not always the case. California’s local power surge came after hard lessons on the hazards of relying on natural gas. In 1998, California began deregulating its electricity markets. The deregulation process was poorly designed, and by 2000 power shortages led to rolling blackouts and extreme hikes in power costs (15). Investigations found that generating companies, including Enron, had deliberately gamed markets to create artificial shortages and maximize profits through the resulting price spikes (13, 22, 23). Prices went as high as $1,973/MWh in 2017 dollars (14). The crisis bled $40–45 billion dollars out of California through inflated energy costs (14); added massive debts to the state budgets; ruined the state’s credit (14); and brought voter fury that ended the political careers of those perceived to be responsible. Most notably, then-Governor Gray Davis was ousted in a recall election for his perceived role in the crisis. Post-mortems of the energy crisis tend to focus on whether to blame lawmakers or private enterprise. Often neglected is that regardless of who drove the crisis, it was only possible thanks to a market structure dominated by natural gas. By 2000, 50% of California’s energy came from natural gas (14). California’s energy policy favored clean sources, and natural gas was the cleanest economical option available 20 years ago. • Heavy price fluctuations. See Fig.1 — due to normal supply/demand variations, US natural gas prices jumped from approx. $3/Mcf to nearly $9/Mcf. This meant half the state’s energy supply was captive to a source that had tripled in price, which neither regulators nor private market participants had any ability to counteract. • Fragile supply chains. Cheap natural gas needs an infrastructure of a few large, arterial pipelines. (In contrast, coal can be carried on any railroad or cargo vessel; nuclear plants need refueling only once every 18–24 months; and wind and solar need no fuel at all.) Gas infrastructure is extremely fragile. A single breakdown or accident can cut gas flows — and thus electricity — across a broad area. This vulnerability contributed to California’s energy crisis. A deadly New Mexico pipeline explosion on August 19, 2000 shut off 15% of California’s natural gas supply (14). This raised gas prices in California, on top of the US-wide price increase. • Prone to deliberate market tampering. Gas power plants can shut down and restart fairly quickly compared to coal and nuclear. This is typically an advantage, as it allows gas plants to respond quickly to changes in demand. This is in contrast to coal and nuclear plants, which once online must stay running. “This is going to be a word-of-mouth kind of thing,” Mr. Williams says on the tape. “We want you guys to get a little creative and come up with a reason to go down.” After agreeing to take the plant down, the Nevada official questioned the reason. “O.K., so we’re just coming down for some maintenance, like a forced outage type of thing?” Rich asks. “And that’s cool?” “Hopefully,” Mr. Williams says, before both men laugh. These efforts succeeded in exaggerating natural price shocks. Adjusted for inflation, ratepayers paid out nearly $2,000/MWh (14) during the height of the crisis. Deliberate price inflation through temporary plant shutdowns is not possible with coal, nuclear, wind, or solar. This type of market interference requires a power source that can be brought on- and offline at will. In other words, it’s only possible in regions that depend on gas. California’s experience carries important lessons for North Carolina. 1. An energy strategy that depends on imports is a poor strategy. While California has extensive natural gas fields within its borders, it doesn’t have enough to supply state demand. Meanwhile, North Carolina has no gas fields. A natural gas strategy locks the entire state into dependence on one or two pipeline arteries carrying imported gas. 2. Regardless of whether gas originates in- or out-of-state, gas supply chains are dangerously fragile. A single incident can spark months of supply shortages and elevated prices. 3. Poor market design enables manipulation. North Carolina has the poorest market design of all — a monopoly. Duke Energy — a major shareholder in the ACP, and North Carolina’s sole power producer — was “near the top of the list of companies accused of overcharging” in the California crisis (24) along with Enron. Enabling a company with a track record of manipulating markets — especially in a region where it already enjoys a monopoly — is courting danger. And while the California crisis took place nearly twenty years ago, Duke has shown itself ready to exploit its monopoly status in today’s North Carolina as well. In a recent trial over negligent waste handling, Duke’s defense reminded the court that — due to federal statutes prohibiting the US Department of Defense (DoD) from purchasing from convicted felons, and Duke’s monopoly status in North Carolina — a guilty finding would result in an immediate and total shut off of electricity to Fort Bragg and Camp LeJeune (25). In other words, Duke Energy threatened national defense readiness to get out of cleaning up its own mess. North Carolina would be wise to think twice before entrusting its energy future to an entity with this track record. The Atlantic Coast Pipeline will result in near total dependence on gas, and the company that delivers it, in North Carolina. California’s costly experiment with natural gas nearly 20 years ago should serve as a lesson. However, it appears history is about to repeat itself. The rate payers, workers, and businesses of North Carolina will not benefit. *Lazard LCOS projections account for advances in technology, but not for the full extent of efficiencies of scale for vanadium vs lithium batteries. Decreased price/kWh with large vanadium battery installations are likely to bring larger price drops than shown in Lazard analysis, and more consistent with figures reported in Forbes. Solar and wind are often viewed as suitable for retail and commercial, but insufficient for industrial use. Industry requires intense heat and has traditionally used fossil fuels such as coal, coke, and natural gas. However, a brief review of today’s industrial technology shows that North Carolina’s industries are better served by renewable sources than by fossil fuels. This section focuses on industries competitive in North Carolina, although much of it will apply to Virginia due to geographic similarities. The state is positioned for success in several industries, including glass, semiconductors, ceramics, secondary metal processing, forestry, agriculture and food, high-tech textiles, composite manufacturing, and biorefining. State resources include the world’s primary source of high-quality quartz for making computer chips and solar panels (37–39); excellent farm and timber production; and strong human resources in the finance, civil aviation, tech/pharmaceuticals, and military/logistics sectors. Other industries will likely never be competitive due to location. These include raw metal production due to lack of ore resources, and the petroleum and chemical industries, due to lack of petroleum fields or refineries to provide raw materials (40). Imported natural gas can be used for process heat in petroleum and chemical refining, but it cannot be used as a feedstock (41). Therefore metal refining, petroleum, and the conventional chemicals industry will not be considered in this review as they are not competitive in North Carolina for fundamental market reasons. • Most heat from industrial gas heating is wasted. This inflates the cost of the final product (42–45) and makes it harder for its manufacturer to compete in global markets. • Natural gas introduces defects and contaminants into the product (42, 46). This adds costs to metal processing, and makes silicon manufacturing (computer chips, solar cells, etc) impossible. • Natural gas cannot be automated effectively in an industrial setting (42, 45). This brings high labor costs, which is more prohibitive than energy costs for most industries. • Natural gas requires long heating times. This makes Lean processes — a prerequisite of survival in today’s competitive global markets — impossible to implement. • Natural gas is considered “clean” compared to coal, but in fact creates considerable soot and NOx emissions (42, 47, 48). These are costly to remediate. The remainder of this section covers local energy’s competitive advantages for industries that are competitive in North Carolina: glass, semiconductors, ceramics, forestry, metal processing, agriculture, high-tech textiles, composites, and biorefining. Glass, ceramics, and semiconductors: Require high-intensity heat to melt raw materials and control cooling. New installations at this time often use arc, resistance, or induction heating because of their operational advantages (45, 49–55). Microwave heating is also gaining traction (56–60). These methods all use electricity rather than combustion. Combustion, even with “clean” natural gas, introduces contaminants and defects that are unacceptable in glass, ceramic, and semiconductor manufacturing. Forestry: Pulp and paper processing is the 3rd highest energy-using industry in the US, after petroleum and chemical manufacturing (48). 80–85% of energy in pulp & paper processing is used to make steam (45, 48). At this time, about 50% of energy for steam generation in pulp processing is provided by burning waste from pulp processing (61, 62). Most existing plants were built with poor energy efficiency; in spite of being in 3rd place for highest industrial energy use, forestry products are #1 for total process energy wasted in industry (48). Improved equipment now available means new pulp mills can generate steam entirely from their own waste (61, 62). Remaining energy needed for motors, calcining mills, etc can be provided through biogas, grid power, on-site solar/wind generation, etc. Secondary metal processing: Covers all metal manufacturing other than smelting from original ore. Melting metal for casting is now done by electric arc furnace (invented 1879) or electric induction (invented 1903) (63). Electric arc furnaces have been available in the metal industry for decades, and are replacing fuel-driven furnaces due to their low cost and nimble operations characteristics (47, 64–67). Melting steel and aluminum by electric induction takes about 600 kWh per ton (68). Given North Carolina’s average year-round insolation (69) of 4.6 kWh/m2/day, 300–350 square feet of solar panels can melt a ton of metal per day. Other types of metal manufacturing include rolling, stamping, hardening or softening parts, drawing wire, welding, etc. To be competitive when made US, metal manufacturing must be highly automated and make products for high-value end uses that need quality and precision. Combustion heating is incompatible with these end uses. Electric arc furnaces, induction heating, laser cutting, vapor deposition, etc are established metallurgy techniques that provide sufficient quality, automatability, rapid processing, efficiency, low emissions, and other operations characteristics for high-value markets (42, 44, 45, 63–67, 70). These all use electricity as their sources for process heat. Agriculture and food: Agriculture and food processing have low energy needs compared to intensive industries like petroleum, chemical manufacturing, and pulp. In spite of the large volume processed per year, food and beverage makes up only 7% of total US process heat use per year (45). Since 70–75% of total process energy in this sector is wasted (71), new plants with modern efficiency gains require little energy compared to traditional installations. Further, process heat needs in agriculture, food, and beverage rarely exceed 250°F. Electricity, solar thermal, and biogas are sufficient to provide process heat needs for this industry. High-tech textiles: The traditional textiles industry has moved to areas with cheaper labor. However, biotechnology is opening up new opportunities in high-tech textiles where highly-skilled workers will be needed. North Carolina is poised to excel in this industry. Examples include biosynthetic production of spider silk for fashion and ballistic purposes (72), smart uniforms that camouflage their wearers from night-vision goggles (73), and more. Lab-grown biosynthetic fibers only require heat to warm incubators. Other high-tech fibers derived from glass, plastics, carbon nanotubes, etc require precise, clean conditions that are not compatible with combustion heating. Electric methods like induction, arc, microwave, vapor deposition, etc are required in this industry (74). Composites: Manufacturing with composites covers huge territory — aviation, car bodies, golf clubs, suitcases, furniture, wind turbine blades, appliances, etc. Effective manufacturing for these parts takes precision, rapid, uniform heating — which is difficult to provide with combustion heating. Advanced resin curing methods currently in use for this industry include a variety of electromagnetic technologies including UV (45, 75), microwave (76), infrared (75), etc depending on type of composite. These methods require electricity rather than fossil fuels. Biorefining: This is the industrial-scale production of materials from microbes, rather than mining or agriculture. An example would be producing ethylene — a raw feedstock for plastic manufacturing, and normally produced by incredibly energy-intensive “cracking” at petroleum refineries (61) — with plant cells cultured in a lab. Energy needs for many facilities may be limited to warming incubators, and can be provided by burning waste biomass (77). Since energy use is drastically lower than traditional refining competitors, energy costs are not an important factor in this industry. Key to success in this industry are a high-tech worker population and low-cost agricultural feedstocks like cellulose, starch, oils, and protein. North Carolina is already well-positioned to succeed in biorefining using an all-renewable power grid. Section summary: Industries that require cheap natural gas — petroleum and chemical refining — are noncompetitive in North Carolina for geographic reasons. Industries that are competitive in North Carolina have process heat needs that are better met by biomass and electric sources such as induction, electric arc, laser stamping, electromagnetic curing, etc. These industry needs are better served by local wind and solar generation than by imported frack gas. • Fears of interference with military operations by wind and solar: Military bases are an anchor in North Carolina’s economy. One issue cited by solar and wind opponents is fear of obstructing training operations and pushing defense installations to relocate out of state. However, the US Department of Defense (DoD) has a clearinghouse specifically to assist local energy projects, with a web portal at https://www.acq.osd.mil/dodsc/. DoD has approved the vast majority of renewable energy projects that have applied, clearly demonstrating that local energy and military operations are compatible (78). Furthermore, fears of interfering with military operations ignore the fact that much of the world is adopting local energy. To maintain global readiness in today’s world, the US military must develop tools and training that operate in conjunction with wind and solar energy generation, and is proactively doing so. • Fears of losing farmland to solar development: North Carolina has quadruple the amount of area needed to supply North Carolina’s electricity in urban rooftops, parking lots, and brownfields alone (79). No use of rural land is needed. That said, solar power can be an important bulwark against farm loss. Farms that add solar power typically do so on only part of their land. Most farms have some acreage that has always yielded poorly. These fields — not good farmland — are the sections that are generally transitioned into solar, since the yield loss from converting them is negligible. The Atlantic Coast Pipeline (ACP) brings unacceptable business risks for North Carolina and the surrounding region. Supply interruptions, price spikes, outages, and even deliberate price manipulation are all established consequences of reliance on natural gas. Meanwhile, solar and wind are now mature technologies. They are cost-competitive without subsidies, and can power a grid 24/7. Renewable local energy creates more jobs per megawatt-hour than imported natural gas, bringing better economic growth than natural gas without additional costs. The Atlantic Coast Pipeline is an economic hazard — an ineffective and outdated energy source with negative economic impacts. Local energy lets the region look forward — to growth, military-friendly energy independence, thriving businesses, and abundant, accessible, permanent jobs. Scientist. Manufacturing & agriculture growth strategist. Follow for news at the intersection of tech, biology, business, and squishy people stuff.